Designed specifically for desert conditions, the D908RR is the last word in desert racing and cross-country. No matter how hot it gets out there or how powerful or heavy your bike is, the D908RR can cope. 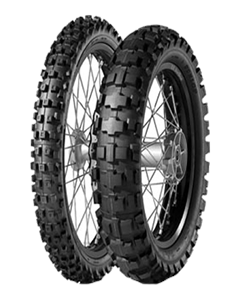 Enduro bikes have evolved, and desert racing hasn’t got any easier, so Dunlop worked hard to develop the D908RR as a combination of dual-sport / desert tyre to help you keep up the pace.